Don't you just love the Bo Bunny stamps? Each collection comes with a beautiful set of coordinating stamps, but you can perfectly mix stamps with other collections too. 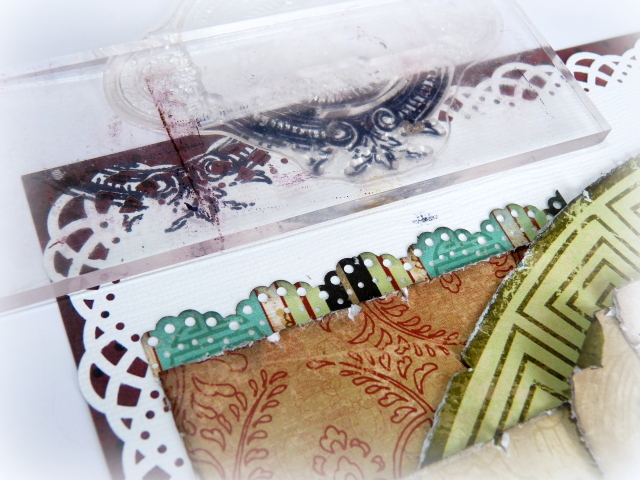 This layout was made with the new Serenity collection and I used stamps from the Weekend Market and Ambrosia collections to further decorate it. 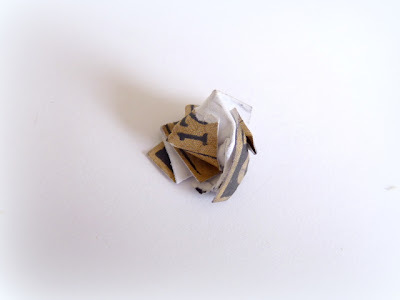 To show you how versatile these stamps are, I'd like to show you several ways to incorporate stamps in your creations. 1) Adding a pattern to your cardstock backgroundThe Ambrosia collection comes with an elegant oval frame stamp. I wanted to add a baroque touch to the corners of my layout and the oval frame was perfect for it. Since I didn't want to stamp the entire image on the cardstock, I only inked the lower side of the stamp. I stamped three of these elements in both the left upper corner and the right downer corner of my layout. 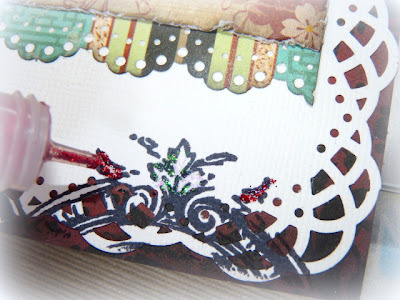 I used red glitter glue and liquid pearls to add a bit of colour to the stamped images. In this way you can easily adapt the stamped images to the colours of your creation. 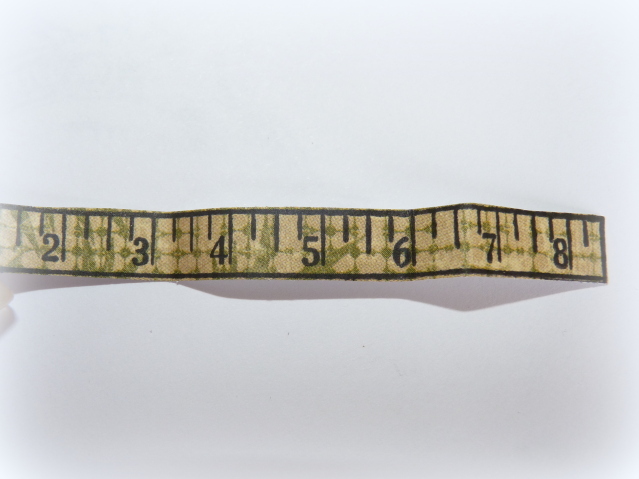 To add dimension to the ruler, I slightly folded it with my fingernails. I adhered it to my page using both foamtape and simple doublesided tape. 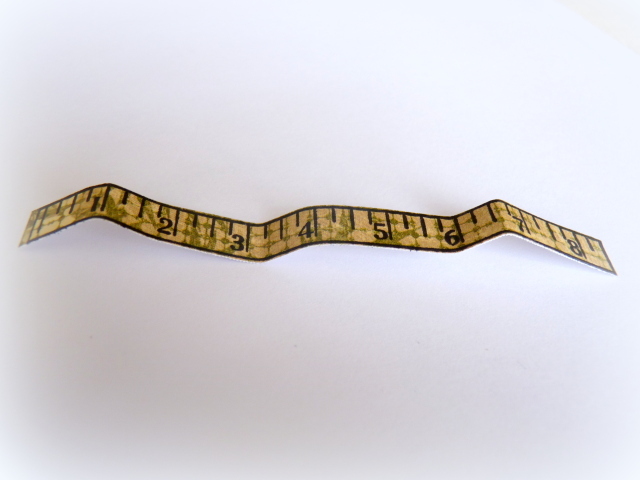 In this way you can make some parts of the ruler pop off the page. I did a similar thing with the Bingo card stamp, which comes from the Weekend Market set too. But this time I took out my distressing tools to give it a weathered look. 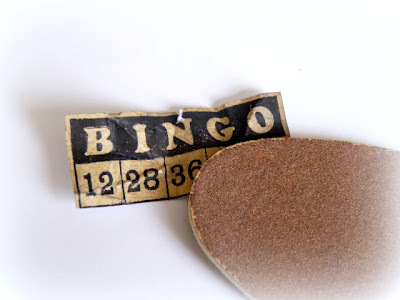 I rolled the stamped Bingo card inbetween my fingers and also teared the edges a bit. In the end I used my sanding tool to accentuate the folds. 3) Adding a pattern to stickersThe Bo Bunny alphabet stickers are beautiful as they are, but you can give them an extra touch in only a few seconds time. Again I used the Bingo stamp to create a pattern on my alphabet stickers, but almost all stamps will work well for this technique. I first stuck down the stickers on a sticker sheet, so they won't get rid of the self-adhesive backside. 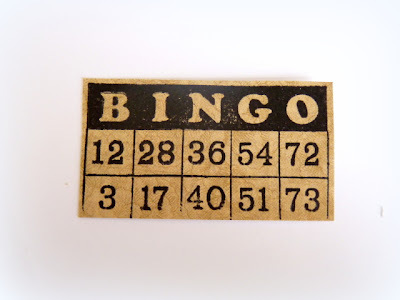 I simply stamped the Bingo card on the sheet with black ink. The alphabet stickers now have a beautiful black pattern. 4) Finishing off your pageMy favourite embellishments by far are butterflies - all kinds and sorts of them. 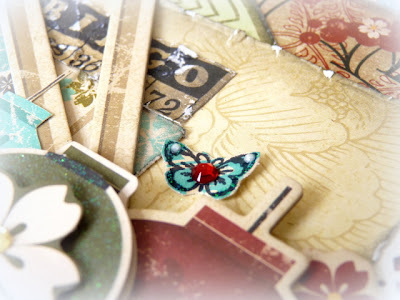 I recently fell in love with the cute Ambrosia stamp set, which contains three butterflies in different sizes. To add finishing touches to my layout I stamped a few butterflies with black ink and fussy cut them. 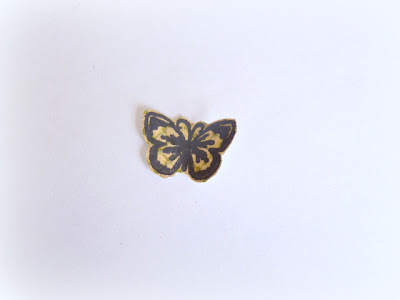 I wanted the butterflies to look like they're really flying of my layout, so I slightly folded their wings. 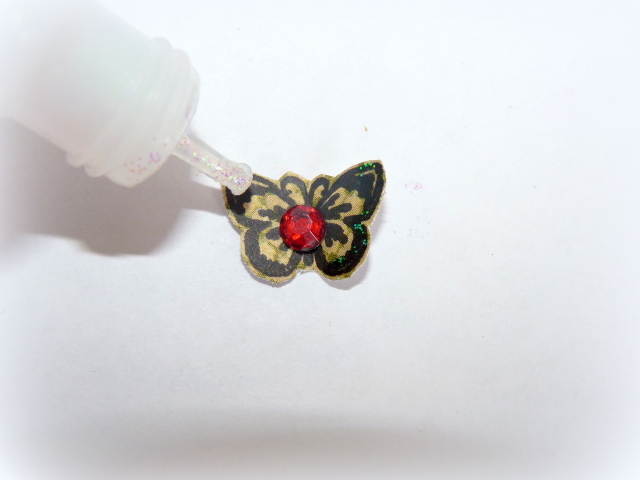 I then decorated the butterflies by adding a jewel and adorning their wings with glitter glue. These butterflies will make a wonderful finishing touch on your layout. The easy part of stamps is that you can use the same image over and over again, without having to buy more papers. You can also easily adapt the images to the paper collection you're using by stamping them on cardstock or paper in a matching colour. I hope you enjoyed my stamping tips and that I inspired you to use stamps on your creations too. The possibilities are endless. We'd love to see how you use Bo Bunny stamps on your layouts, cards and altered items. If you add a link to your creation in the comment box, I'd love to check it out! Thank you so much for taking a peek today and have a wonderful weekend! Wow, fabulous layout and Romy, thanks for your lovely Tut! 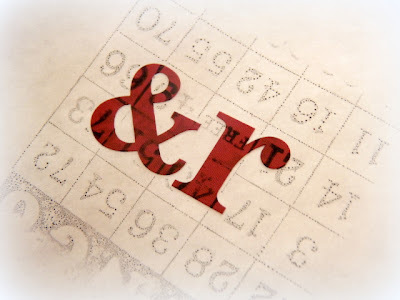 I love how you played with the stamps, it has inspired me to use my stamps on my own projects. 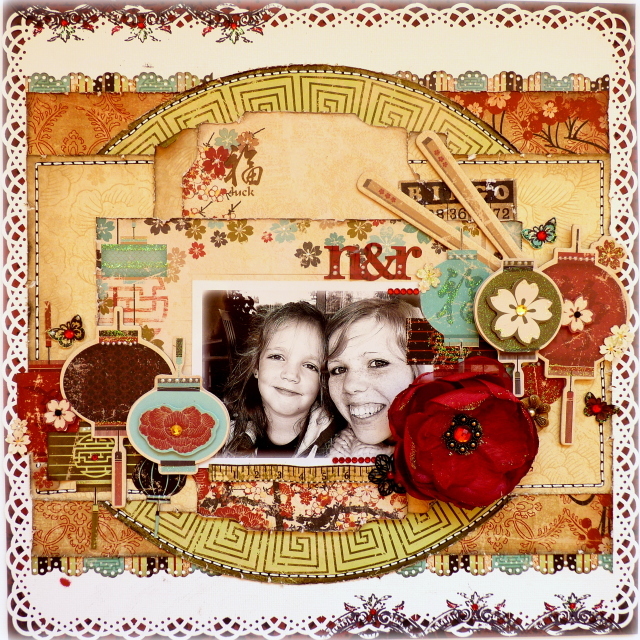 Stunning layout Romy! You did such a fantastic job with this collection and the tutorial is very clear. Thanks so much for sharing! Wow wow wow!! I am just IN LOVE with this layout!! And thanks so so so much for all the fabulous tips! beautiful LO! thanks for tips on using the stamps. I usually read Bo Bunny's blog through my google reader, but I just have to come over and say WOW! Love the colors of this page, and I love the stamping accents that you've used. The blog has gone through an update too, and it all looks wonderful! Great layout and your tutorial was a big help. Thanks. What a wonderful tutorial Romy! And your layout is gorgeous!!! Your layout and the tutorials were so inspiring. I will say I learnt alot today. Thanks so much for sharing your beautiful layout and your fantastic tutorial. I'm off to try these techniques! This is a really adorable page and love the photo in it. 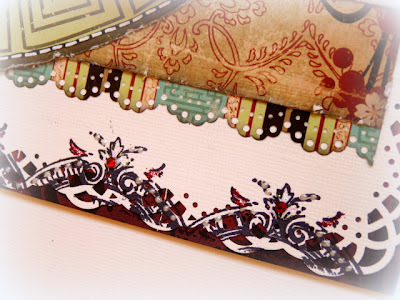 You always do a fantastic job on your projects and I love your style :) Thanks for sharing! This is really such a lovely layout and the little touches just make it so great! Beautiful!